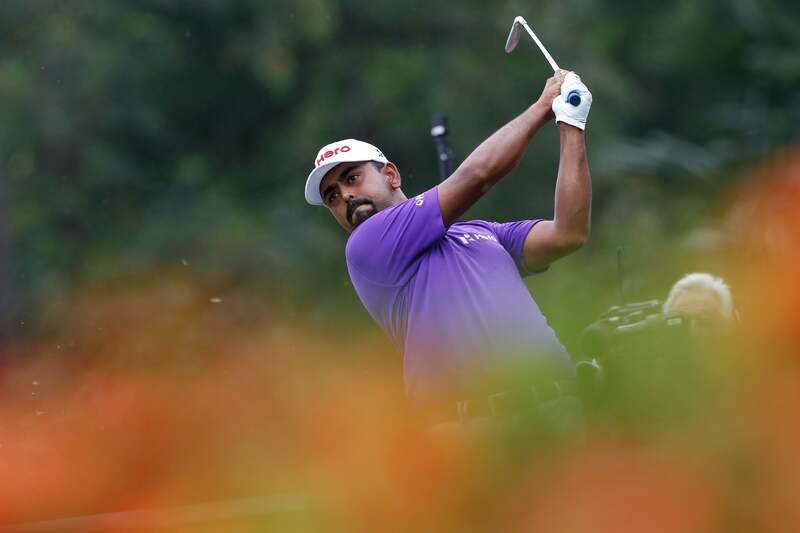 Anirban Lahiri of India follows his shot on the eighth hole during the third round of the CIMB Classic. KUALA LUMPUR, Malaysia (AP) Defending champion Justin Thomas endured a terrible start to the third round of the CIMB Classic after the American faltered with three bogeys and a double bogey to finish with a 1-under 71 Saturday. Thomas was swiftly overtaken by Anirban Lahiri, who shone at the TPC Kuala Lumpur with nine birdies for a 65 to open up a four-shot lead going into the final round on Sunday. Thomas had two bogeys and a double bogey in the first three holes of the back nine. ''Yeah, it was really just terrible golf for the first 13 holes. To be 4-over par out here, it was a very weird feeling. I don't know,'' he said. At least the 23-year-old Thomas ended the penultimate round with five consecutive birdies. Lahiri's low score positioned him at 19 under, a mark which could have been better if not for a double bogey on the 12th hole in an otherwise flawless scorecard. ''I just told myself that I got rid of my double-bogey early in the round today and just tried to focus on what I needed to do,'' said Lahiri, who was runner-up at the Asian Tour's Macau Open last week. Scotland's Russell Knox played another solid round for a 68, to move tied for second with Thomas. Trailing a shot behind them are Derek Fathauer, James Hahn and Hideki Matsuyama, who are tied at 14-under. Ryan Moore, the 2013 and 2014 winner, finished tied on 17th after managing a 70.